The LVU90 Series has been discontinued. Please see the LVCN210 Series as a possible alternative or contact our Flow Engineering department. A high frequency sound wave is pulsed two times per second from the base of the transducer. The sound wave reflects against the process medium below and returns to the transducer. The microprocessor based electronics measure the time of flight between the sound generation and the receipt, and translates this figure into the distance between the transmitter and the process medium below. The two-wire, small tank non-contact level transmitter is mounted through the top wall of the tank and provides non-contact measurement up to 6'. With non-contact technology, the transmitter is an excellent choice for applications with dirty, coating or scaling type media such as acid waste. 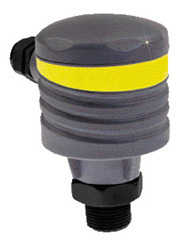 The compact design is the perfect size for small tank applications. The surface of the level being measured must be free of fumes, vapors, foam and the surface must be flat; the signal may be lost if any of these conditions are present. † For LVCN-51 with CE approval, add suffix "-CE" to model number, add $50 to price.